The first Catholic Church in Hazel Grove was a mission chapel in Commercial Road formerly a Mount Zion Chapel and opened in 1897. Hazel Grove was part of the parish of St Philip and St James in Edgeley (this became Our Lady and the Apostles in 1905). Priests served the parish from Edgeley on a Sunday and the nucleus of an identifiable community was formed. Numbers grew and eventually means were found to finance the building of a more permanent home for the independent parish, which was founded in 1923/24. A plot of land in Green Lane, on which to build a church and school was purchased for £4,500. The Rt. Rev. Hugh Singleton, 5th Bishop of Shrewsbury, blessed the site of the altar and laid the foundation stone for the new church dedicated to St Peter on the 23rd August 1930. 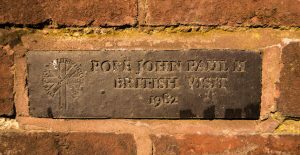 The building was completed in April 1931 and was designed by Edward Kirby of Liverpool and built by Daniel Eadie & Son of Stockport. Messrs Shepherdsons of Great Moor made the pine furniture and the parishioners donated the statues of Our Lady and the Sacred Heart. The official opening took place on the 12th April 1931 when Canon McGeever of Our Lady and the Apostles, in the presence of the Bishop, Fr Kirby the former rector and Fr. James Kelly, the Rector at the time, celebrated a solemn High Mass. The late fifties and sixties saw an increase not only in the Catholic population but in Hazel Grove generally and the church was enlarged in the mid sixties to accommodate the expanding community. Further internal alterations were made during the seventies to reflect the liturgical changes of the Second Vatican Council and the latest alteration, which was completed and blessed in April 2006, has been to re-order the sanctuary and erect a new permanent altar. The first Catholic Church built in Stockport after the Reformation was dedicated to two apostles, Philip and James. This church stood at the top of Old Chapel Street and on the corner of King Street West in Edgeley and in 1905 was replaced by Our Lady and the Apostles on Shaw Heath. When Fr Tom Osbyrne, parish priest of Hazel Grove built a new church in Offerton in 1967 it was dedicated to the apostle Philip and so provided a link with the old church. St James re-appeared with the dedication of the new High School in Cheadle Hulme in the 1970’s. The church hall had seating for 320 and two sacristies. It was built in downing rustic brick and the reredos, altar and two lecterns were made of teak. The cost of the building was £12000 and, at first, it was only used for Sunday Mass and the rest of the week as a social centre. The first priest to take over the new parish was Fr Robert Abbott who bought 123 Marple Road for use as a presbytery. He was followed in 1972 by Fr Brendan Hoban who was responsible for building a primary school on Half Moon Lane and in 1977 a new presbytery adjacent to the church. The school was extended in 1986 under Fr Kevin Daley. 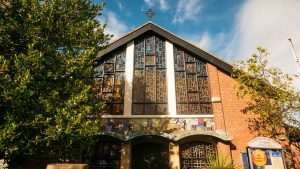 The Parish Centre is a valuable asset in the life of our Parish, located in the Church car park minutes from the A6 and Hazel Grove Train Station. It is well used by many Parish Groups and other local community organisations. The Centre is available for private events of any occasion, birthday parties, weddings, charity events, meetings etc. 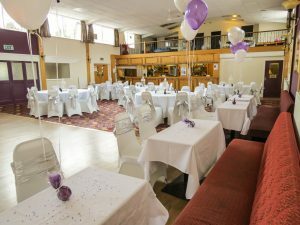 There are a number of facilities available; a meeting room, kitchen, stage, large dance floor, bar, space for a large number of seating and side rooms for buffets or small events. For Friday – Sunday bookings, phone 07483 114783. If you would like to book the Meeting Room, please contact Helen Lyons as above. St Peter’s looks after the spiritual care of Roman Catholic patients at Stepping Hill Hospital, whose catchment area covers parts of north Derbyshire, Cheshire and south Manchester. Visiting of patients on the wards is undertaken on a bed-by-bed basis by an ecumenical team of chaplains and volunteers. For reasons connected with the Data Protection Act 1998, chaplains are no longer provided with ward lists. Therefore, if you are going into hospital, please let us know directly so that a visit can be arranged. Kindly give as much detail as possible, such as your name, date of admission and ward (if known). You can either contact the Chaplaincy Office or St Peter’s. In an emergency, the clergy can be paged from the hospital switchboard. St. Peter’s and St. Philip’s have a number of schools under their care. Catholic education is available for those who wish their children to be educated in a Catholic faith environment. 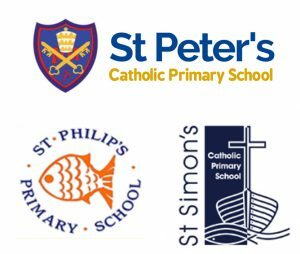 We are lucky enough to have three primary schools – St Peter’s, St. Philip’s & St. Simon’s – in the area. We also have a number of secondary schools, the principal two being Harrytown Catholic High School and St James’ Catholic High School. There is also a Catholic sixth-form college, the largest in the country – Aquinas College. All these educational establishments are served by staff committed to their Catholic faith, and who have a spiritual input into the lives of the schools/college. All have a priest chaplain or lay-chaplain. Chaplains support the staff in delivering a catholic education to our young people and are involved in leading the school’s/college’s liturgical life, as well as being available for advice, help and the pastoral care of staff and students. St. Peter’s and St Philip’s are part of the Local Pastoral Area 20 under the patronage of Mary the Mother of God. Together with St. Peter’s and St Philip’s; St. Vincent’s (Bramhall), St. Ambrose’s (Adswood), Our Lady’s (Shaw Heath), St. Joseph’s (Stockport) and St. Bernadette’s (Brinnington) make up the LPA. Through out the year there are many LPA events such as Mass on New Year’s Day (Solemnity of Mary Mother of God), Marian Songs of Praise & Reconciliation Services. There is also a coordinated approach to Baptism preparation for children & adults. Joint Confirmation programmes are run in the area and preparation for Marriage.